Recruitment and career opportunities. 100% free college tuition. Mon-Fri 9-5, Sat-Sun appointments only. Making financial lives better for our customers, our clients and our communities through the power of every connection. ATM available. Blows outs and hair extentions. Various services. Eyebrow threading is a depilation technique which originated in India, and is also widely practiced in the Middle East. The hair removal technique is not just for the eyebrows: threading can be used to remove other facial and body hair as well. The whole world in one bank - right in Stamford Downtown... “Citi never sleeps.” ATM available. Buy, Sell, Repair. Computer and smartphone sales and repairs. Whether you have come to our studios to learn to ballroom dance for an event, explore an alternative way to stay in shape, pursue dancing competitively, or to simply have fun, it is our mission to ensure that each of our Dance With Me students leave our studios naturally confident and comfortable on the dance floor. Digital printing, color posters & presentation materials, digital archiving, high volume color output, multi-media service & production. Unique, beautiful, delicious fruit has never said so much. Family programs and counsel services. Professional nail care, skin care and waxing. Helping as many people as possible to find good jobs by helping as many clients as possible to find good people. Hair care for men, women and children. A community bank serving Stamford since 1851. ATM available. Manicure, pedicure, waxing, U.V. gels and airbrush tanning. Income tax preparation and year round services. Professional craftspeople using the finest materials for shoe care and repair. Services also include repair of handbags and leather goods. Digital and conventional photography at its finest. The perfect way to document the special events in your life. 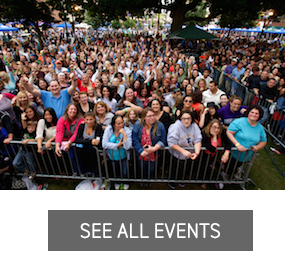 Corporate or private parties, weddings, Bar/Bat Mitzvahs and more. One of the world’s most comprehensive banking services - enabling you to take advantage of many rich opportunities in over 40 countries and territories around the globe. ATM available. Repairing shoes, fine leather goods and more. Quality European craftsmanship. We can do what your local shoe maker can't. Full line of leather care products. Full service banking for Stamford residents and business owners. ATM available. Enter our Urban Salon & Spa located in the heart of Stamford Downtown! Feel a warm & friendly vibe and experience our talented team. Specializing in wedding dresses, men & women's alterations. Rated a "5" Star Tailor by Yelp website. We want to help you through your next tax season. Take advantage of our experience. Don’t give the IRS more than their fair share. We file Individual, Business and Amendment tax returns. Also, we have offer the following services: bookkeeping, payroll, business quarterly, tax filing, citizenship applications, Immigration petition applications and Notary Public. Premiere boutique fitness and spin studio. Full Service cosmetic and family Dentistry. 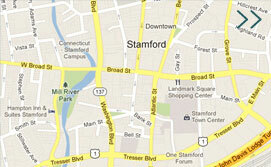 Stamford's premier location for Ballroom and Latin Dance instruction. We offer private and group classes taught by certified instructors. Full service printing and graphics facility. Named one of the top printers in Fairfield County. We specialize in high quality, excellent customer service and competitive prices. Paper, posters, specialty items - we do it all! Exchange your gold for cash. Let Nails Hollywood take care of all your beauty needs. Come in for waxing procedures and nail treatments as well as full body massages. Specializing in sculptured nails, silk wraps, manicures, airbrush designs, gel nails, acrylic nails, pedicures, and waxing. The Old Town Hall is open for coworking! If you're currently looking for inexpensive place to work, look no further! A full service graphic design, printing, sign and marketing services company. We can help you to create, produce and distribute essential printed materials for your business. Designer eyewear, 1-hour eyeglass service, contact lens replacement or new fittings, eye examinations, diagnosis and treatment of eye diseases. “Everything starts with you.” ATM available. The most convenient way to lose fat in Stamford. A program that utilizes fitness, nutrition coaching and meal prep all under one roof. Digital & offset printing, copying, graphic, design, mailing & legal duplication services. Business cards, letterhead, envelopes, brochures, newsletters, postcards, booklets, flyers, labels, NCR forms, menus. A full service hair salon which offers a relaxing atmosphere and friendly and knowledgeable staff. The unique experience in full-service salons offering quality service and professionalism. Facials, peelings, body treatments, waxing, eyelash and eyebrow tint. Complimentary custom prepared cell renewal cream with your first facial. Barber shop , haircut & shave. A cosmetic and general dental office that delivers exceptional dental care in a relaxing environment where patients are comfortable and get the individual attention they need. Stamford's oldest and largest driving school. Classes taught multiple times per week. For over 150 years, the Stamford Family YMCA has provided the local community with health and wellness programming focused on youth development, healthy living and social responsibility. On-line and on-site enrichment programs are offered and free Citizenship, GED Preparation, National External Diploma, High School Completion, Family Literacy and ESL classes. Advanced level classes are available at our Stamford English Language Academy. Stamford Public Schools (SPS) comprises nearly 16,000 students, over 1,500 professionals, and 21 schools, including seven magnet schools and three International Baccalaureate sites. SPS has a total of 13 elementary schools, five middle schools and three high schools. The mission of the Stamford Public Schools is to provide an education that cultivates productive habits of mind, body and heart in every student. SPS is proud that our district is as rich in diversity as it is in talent. We have students from many cultural backgrounds and geographic locations—as demonstrated by the more than 65 different languages spoken in the homes of our families. SPS offers our students a learning experience rich in cultural diversity and reflective of the global society in which they will work and live. Fun, down-to-earth yoga that feels fantastic! For people of all shapes, color, and size; conveniently located in the heart of Stamford Downtown. We believe that yoga is about standing on your own two feet more than it’s about standing on your head. So our classes are based around simple shapes and functional movement—not acrobatics. Providing insurance and financial services. Auto, Home, Life, Health. Continuing to provide wonderful hair care to the entire family for over 30 years. Mon,-Fri 9am-7pm, Sat 9am-6pm & Sun 9am-5pm. Walk-in's welcome. Your own IT support resource: hardware repairs (tower, PC's, Laptops, Macs, Smartphones), virus removal and computer cleanup; data recovery; website maintenance & design. The Ferguson Library is Stamford’s public library system, consisting of the Main Library, DiMattia Building downtown, the Harry Bennett Branch, the Weed Memorial & Hollander Branch, the South End Branch and a traveling bookmobile. Visit Threading Brow Bar for threading services, facials, waxing, and henna tattoos. Your neighborhood barbershop here in the Stamford Town Center. Friendly service meets professional haircuts. Featuring weekly discounted specials! A convenient full service dental center headed by Dr. Ross Krasnov which performs preventative, restorative, and prosthetic dental services. A better concept. A better workout. A better future. UConn is ranked in the top 20 of the nation's best public universities. UConn Stamford serves 1,500 undergraduate students and 500 graduate students (primarily in the School of Business). The undergraduate program offers students a full four-year degree program in 14 majors, as well as the ability to begin any UConn major with the option to change campuses to Storrs. The Connecticut Information Technology Institute (CITI) provides professional IT training and education in the latest IT applications, operating systems, internet and programming. Recently developed undergraduate programs include Digital Media and Design, while a new M.S. in Business Analytics and Project Management will launch in January 2017. UConn Stamford hopes to cement its place in Downtown Stamford by serving as a nexus of activity and opportunity for the university, the local community, and industry. Vanity Studio is Stamford’s premier trendy hair salon and hair bar. Specializing in healthy hair and styling for all hair types including natural styling, silk presses, blowouts and hair extensions which can be conveniently purchased in our on-site Hair Bar. Private room available. State certified full cosmetology program. Call for a tour! Professional eye care exams, contacts, eyewear and sunglasses. Full service bank. ATM available. Three generations of service and dependability since 1955. Dry cleaning, shirts, leathers, suedes, storage, tailoring & more!